Euthanasia. When is the right time? Good health doesn't last forever. Even the healthiest pet can eventually develop kidney disease, diabetes, cancer, or swallow string or other foreign object. When illness or injury strikes, pet health insurance can help you avoid an unexpected hit to your bank account. How Does Pet Health Insurance Work? Most pet health insurance plans reimburse you for the fees you pay for veterinary care. A few pay veterinarians directly, but only if the veterinary office participates in the plan. After you pay the veterinarian, you'll submit your receipt to the health insurance company and wait for your reimbursement. 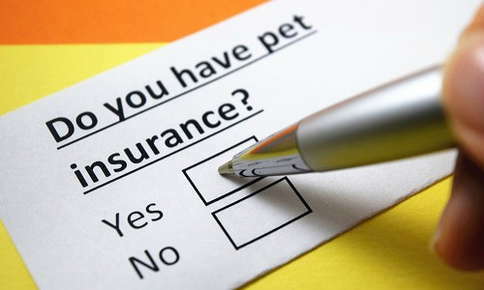 Pet health insurance plans have exclusions and deductions just like the health insurance you purchase for your family. Your plan may not cover pre-existing conditions or may only cover a certain percentage of the bill if it determines that the charge is above the usual, customary, and reasonable fee for the service or procedure. Which Animals Are Covered by Health Insurance? Dogs and cats aren't the only animals covered by pet health insurance. Plans also cover birds, rabbits, horses, guinea pigs, and other pets. Unlike your own health insurance, you'll be able to choose specific coverage components for your pet. If you're worried about the cost of veterinary care following an accident, but don't anticipate that you'll ever have any trouble paying for annual exams, teeth cleaning, or vaccinations, you may opt for accident insurance only. Adding illness and wellness coverage ensures that your pet is completely covered no matter the reason for the visit to the veterinarian. What Should I Consider When Choosing a Pet Health Insurance Company? Coverage. Do you want coverage for accidents, animal care, or illnesses? What services and treatments are included in each component? How are genetic diseases covered? What about high-tech treatments, like laser surgery? Finances. How much will you pay each month in premiums? How much does the company charge for deductibles? Will you have an annual deductible or separate deductibles for each incident? How much will premiums rise every year? Will you pay more to insure your older pet? Is there a discount to cover multiple pets? Will visits to specialists or emergency clinics be covered the same way as visits to your pet's vet? Claims. Are claim forms easy to understand and complete? Can you submit them online? How soon can you expect to receive your reimbursement after submitting your claim? Pre-existing Conditions. Are pre-existing conditions covered? If your pet has a pre-existing condition, can you obtain coverage for the condition after a waiting period? What conditions are considered pre-existing? Portability. Can you still use the insurance if you move to another state or country? Is Pet Health Insurance a Good Idea for Your Pet? You'll need to evaluate your finances before making a decision about pet health insurance. Will you be able to pay thousands of dollars if your pet is hit by a car or needs surgery for hip dysplasia? Over the average 10-year lifespan for dogs and 15-year lifespan for cats, pet owners can expect to spend between $9,000 and $13,391, according to a 2018 report by ndp/analytics. If you have insurance, you won't have to make a difficult decision if you don't have enough savings to cover a big veterinary bill. You'll simply pay for the treatment with a credit card, then make a big credit card payment when you receive your reimbursement. Insurance is usually a better value if you buy it when your pet is young, but that doesn't mean it's not a good idea if your pet is a few years old. Health insurance can be costly if you buy it for the first time when your pet is older, although coverage is available for senior pets. In some cases, you may find that the covered services don't justify the high monthly premiums for your elderly pet. Before you make your decision, you may want to talk to your veterinarian. He or she can inform you if certain costly health problems are common in the breed and may even pass along a little information on companies that clinic clients prefer. Regular veterinary care and pet health insurance can help you ensure that your pet receives the treatment they need. If it's time for your pet's annual exam, or you're concerned about a health problem, give us a call to schedule an appointment. Pet MD: What to Ask When Choosing a Pet Health Insurance Provider? NBC News: Pet Insurance: A Good Deal? Or a Rip Off?